Blueberry Pie Recipe: How to make the world's best blueberry pie! With EASY illustrated directions! An easy and GREAT blueberry pie recipe! Want to make the best blueberry pie you've ever had, with a crumbly topping and a sweet deep blueberry flavor, and don't want to spend all day in the kitchen combing the Internet or studying overly complicated recipes? This pie is so easy and has stood the test of time; read the comments near the bottom of the page. What makes it different from other blueberry pies is: it's mostly blueberries, not crust or sugar; and the combination of spices is superb! And it doesn't matter if you're not a chef or have never made a pie before! Following these illustrated directions ANYONE can cook a perfect blueberry pie! Take this pie to a Fourth of July picnic and be the hit of the party! Never made a crust, either? Fear not, they are really simple. 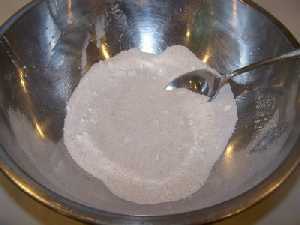 Click here for instructions about making a flour pie crust. It will open in a new window, so just close the new window to return here. 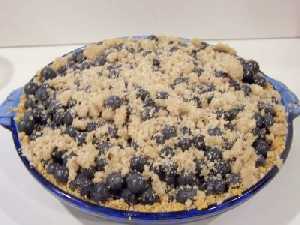 I prefer blueberry pie in a graham cracker crust; click on the link for directions. 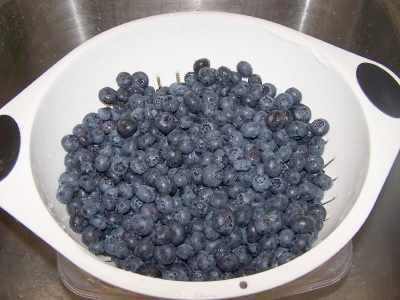 .Now is also a good time to get the oven preheating to 375 F.
Add the blueberries to the pie crust. Just pour them in! There's lots of air space and it will cook down, so don't worry if they mound up about an inch (2.5 cm) above the edge of the plate. 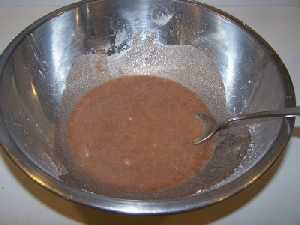 Just pour the mixture of sugar, juice, etc. into the pie all over the blueberries. If it is a gloppy liquid, don't worry, just pour it somewhat evenly over the top. But it doesn't take perfection; it will smooth itself out in the oven. 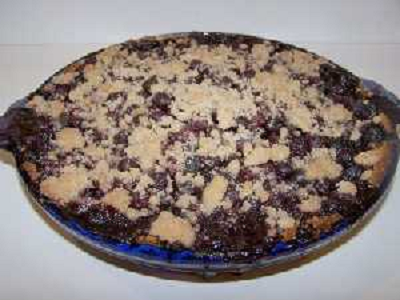 A visitor writes on July 12, 2013: "I love blueberry pie and I love to cook. ( I was a gourmet waiter before I became a Christian). I tried different recipes and then found yours. It was the best I found and then I think I improved it just a little by sprinkling 1 tablespoon of butter over the top of the berries before putting the top crust in place. Thank you very much for a great recipe! Rev. Charles "
A visitor writes on June 13, 2013: "The BEST blueberry pie. I came across the website last year looking for an easy pie to make for someone like me who's never made one. It's simple and fantastic, and I always use grape juice and allspice and cinnamon. It just makes it all wonderful! It's 11:00 pm and my boyfriend and our friends are staying late, despite a long work day tomorrow, just to have some of the amazing blueberry pie. Thank you!!!" Comments from a visitor on August 11, 2012: "every year we vacation in north Conway, new Hampshire and bring blueberries that we pick from home. When we get to NH, we have been using this blueberry pie recipe for over 4 years now.We love it and this is one of the things we look most forward to on our summer vacation! Thanks so much for sharing!!!" Comments from a visitor on May 16, 2012: "The Blueberry Pie turned out amazing! Thank you for sharing the love!" Comments from a visitor on December 06, 2011: "I absolutely LOVE, LOVE LOVE, your website. It has prompted me to try making pies, jams, etc. that I never would have thought to try. I have to say that your Blueberry Pie recipe is THE BOMB. I have made it for several occasions and now everyone asks me to bring it when they invite me over. (Is it me they like or the pie?) I have become very popular lately. Thanks so much for all the information. Your website is fun to read and certainly inspirational to those of us who are first time bakers. My Dad and I are going to make your Pumpkin Pie next. He's out hunting down the pumpkins. Such Fun for the whole family." 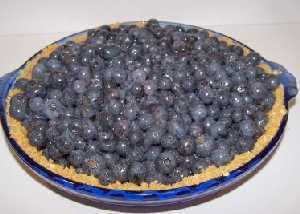 Comments from a visitor on May 25, 2011: "I have just made my second blueberry pie ever using your recipe both times. I used a boxed pie-dough mix and double crust. I didn't have allspice, so I substituted nutmeg, and that adds an extra element to the "yummy" factor. I cannot begin to tell you how delicious this pie is, and it's so EASY to make. My family and I thank you! " Comments from a visitor on May 23, 2011: "WOW!!! I made your Blueberry Pie today. This was my first attempt at making a "from scratch" pie and I was so pleased! I was concerned the filling would not set up because you don't cook it first but, this was by far the best blueberry pie I've ever had. Hands down. THE BEST!!!" Comments from a visitor on May 19, 2011: "I have tried your Blueberry pie, and it was absolutely delicious. This was my first time ever baking a homemade pie, and I was very pleased with the overall taste and presentation of it (literally, I took pictures of it). I think what worked very well was the correspondence of the grape, the cinnamon, and the lemon juice in the filling. I will never bake a different recipe-I'm serious! I cannot wait to give my grandfather a few slices of this pie. Thanks for the wonderful recipe! " Comments from a visitor on November 26, 2010: "I found your recipe for making a blueberry pie a few days ago and since I was making that as one of my Thanksgiving pies, I decided to try it. Now, my 85 year old grandmother(Nana)makes the best pies, hands down. I learned from her and every Thanksgiving, I try new recipes to go with old favorites. Well, my Nana tried a piece of my blueberry pie and insisted on having the recipe! She is thrilled that she can completely skip cooking and thickening the blueberries first. I have to say that everyone was extremely impressed. Thank you for the greatest & easiest blueberry pie recipe! I'm trying the pumpkin pie one next." Comments from a visitor on November 18, 2010: "I found this website by going to Google and I typed in "World's Best Blue Berry Pie" and let me just say it sure is. We picked fresh blueberries this past summer and froze them and I couldn't decide what to make with them, so when I was asked to bring a pie to Thanksgiving this year I started in on the research. I thought this recipe was super easy. I went with the Graham Cracker crust and it was the best I have ever had. 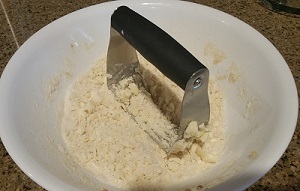 along with the crumb topping everyone was amazed. I made a sample one first and took it to my work and everyone loved it. This recipe is going in the family cook book for sure. Thanks so much for an amazing recipe." Comments from a visitor on June 08, 2010: "I just made the "World's Best Blueberry Pie" and it sure lived up to its name! It was FANTASTIC!!! I have made good blueberry pies before, but none have met this one! Everyone loved it. I made it with a double crust, latticing the top. I used the crust recipe that you have, and that was the best crust I've ever made! THANK YOU! THANK YOU! THANK YOU! I did two things that I did that helped. After I washed the berries I put them in the salad spinner and that helped get rid of any excess water. Then due to the climate that I live in, I put a bunch of ice in a large zipper bag, and chill my granite counter top before I roll out dough. This worked well to help keep the dough cold. " Comments from a visitor on October 29, 2009: "I just wanted to thank you for the best blueberry pie recipe ever. I have only been baking my own pies for three years (next month will be my third Thanksgiving) and this recipe has been the biggest hit. My family has actually fought over who got to take the leftovers home. Before, my father would have only one slice a year, but now I end up baking him at least 3 whole pies between Thanksgiving and Christmas. " Comments from a visitor on October 03, 2009: "This was the best blueberry pie i had ever made. I usually don't like blueberries, but my family does, and they all loved it, and so did I. I followed the recipe and it came out perfectly, also I recommend the crumb top because the dough top can be a little overwhelming." 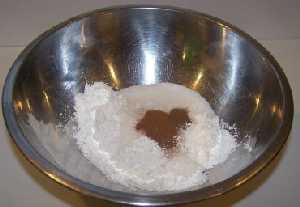 Comments from a visitor on August 21, 2009: "Loved your recipe it was so simple and just what I was looking for. 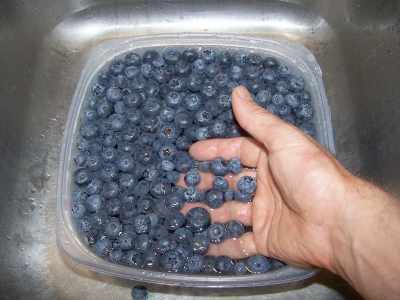 Now I can enjoy my blueberries that I grow. I used raw sugar and it worked excellent I also have a gas well so I put the crock in the oven on keep warm worked out just fine. thank you for sharing it." Comments from a visitor on September 01, 2009: "Here in the Upper Peninsula of Michigan we have an abundance of wild blueberries. I just wanted to say that this is a very easy and delicious pie recipe. I have made it 4 times in the last two weeks. My family loves it! To make it even easier I have been using a frozen crust already in the pan and then using a Pillsbury refrigerated crust for the top crust. It makes it a lot easier to whip a pie together to bring somewhere for dessert. And everybody is impressed with the fabulous homemade pie!" Comments from a visitor on August 08, 2009: "I LOVE the Blueberry Pie recipe!!!! I made it for a dinner with friends and have been making it EVERY week since! The recipe is so simple and inexpensive. I'm a pretty novice chef, so I was amazed that I could create something this delicious! Thank you so much! " 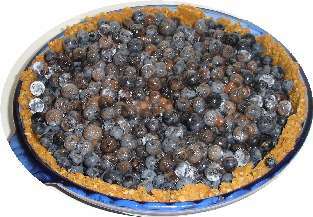 Comments from a visitor on July 26, 2009: "That is truly the best blueberry pie recipe I have ever tried. Thanks"
Comments from a visitor on July 18, 2009: "I made the blueberry pie and the whole family loved it. I used the graham cracker crust and have a tip to make it even easier. Just buy an extra pie crust. Put in in a baggie and crush it up. Use this as your topping." Comments from a visitor on March 17, 2009: "This is in regards to your blueberry pie recipe. I had some frozen blueberries in the freezer. They have been there for awhile. I also had to already made pie tin doughs from the store. I was searching for something quick and easy to make my husband for that night. I wanted to use up those blueberries, and pie doughs. They have been in the freezer too long : ) Your recipe was quick, simple, and tasted FANTASTIC! My husband was so excited to try them when he saw them in the fridge. (I made two) He said it was the best blueberry pie he ever had! He also said it was even better than than the ones in the store or restaurants we have been to! I did not have the 5 spice so I just added the cinnamon and it turned out great anyway. I can't wait to get fresh blueberries and try this recipe again. I am sure it will taste even better! Thank you so much for this recipe. It was packed full of blueberries and not runny stayed together. Really great! Will make again and again and again! " Comments from a visitor on August 27, 2008: "Made the blueberry pie with the graham cracker crust and struesel and have to say this was the first time I have ever had a blueberry pie that actually had a lot of fruit in it, not just thickened juice, and it was able to hold its shape, it didn't run all over the plate. As to taste, my wife and I both agree it was the best we have ever had. Can't wait to try the fresh pumpkin pie recipe. Thanks for the recipe, it will get used often. Fresh fruit pie lover in Tucson AZ." 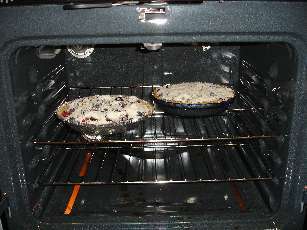 Comments from a visitor on July 13, 2008: "I just tried your blueberry pie recipe and it was AWESOME!!! Thank you so much. We had a BBQ tonight and the pie was the hit of the evening. (I picked the blueberries from a farm in Indiana, but we also have many great farms here in Michigan as well.)" Comments from a visitor on July 13, 2008: "I have to tell you, this website has been a huge help. I haven't gardened in a few years and now that we've moved out of town so I have some space to play, I've been busy canning and freezing. The information you provide has been wonderful. The blueberry pie was a huge hit at our family Fourth of July gathering. I even took your blueberry jam recipe, made some modifications with it, and made a mixed berry jam with blueberries, blackberries, and wild cherry infusion for the liquid. Comments from a visitor on June 22, 2008: "I made your recipe w/1/2 the sugar and lemon zest w/incredible results...do you think I could follow the recipe w/frozen blackberries w/the same wonderful results? I made the blueberry pie for a neighbor who frequents Maine and he said it was better than anything he has had in Maine. " Comments from a visitor on May 31, 2008: "I LOVE your recipe for 'the best blueberry pie' and use is regularly. Just recently my partner was diagnosed with diabetes so now I look at the 'total carbs' on all things. I was wondering if you have that information, I DID notice the 'Stevia (in a prepared form like Truvia, it measures same as sugar; if you use another form, you'll need do your own conversion) - or Splenda, if you prefer, ' & sugar mix, which I am going to use today. " Comments from a visitor on March 3, 2008: "Thank you for your Blueberry pie web page (http://pickyourown.org/blueberrypie.php) and recipe. I made my first blueberry pie ever in February using your recipe. I used 3 cups of Blueberries plus I added 1/2 cup of raspberries. My wife was thrilled with the results (except for the extra calories to her waist line)."